Chip in to keep OurActionStation running! The OurActionStation community campaign site is run by ActionStation to work together for a fair society, a thriving environment, human rights and global peace, and transparent accountable politics. Together we can get results. Everyday New Zealanders are using OurActionStation to lead and win campaigns for their communities on the causes that are important for all of us. 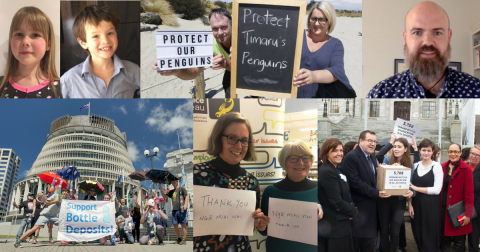 In 2018 OurActionStation campaign successes included every day people winning an inquiry into the Family Court system; saving the habitat of Little Blue Penguins in Timaru; restoring funding for the 'Growing up in New Zealand' study; gaining a student loan extension for medical students that means more doctors in our communities; and winning funding of $18 million for Mates and Dates, a healthy relationships course for secondary school students! ActionStation’s support for community campaigning is only made possible through the contributions made by people like you. Your contribution, however big or small, will go towards supporting these citizen campaigns, by helping: - set up and promote the campaign; - attract media; - navigate social media; - organise events; - connect with politicians - win campaigns! A regular donation can enable ActionStation to offer sustained support through further guidance and training opportunities. ActionStation is a community of over 190,000 everyday New Zealanders who act together in powerful and coordinated ways to create what we cannot achieve on our own: a society, economy and democracy that serves all of us - everyday people and Papatūānuku, the planet we love. We rely entirely on member donations and grants to keep this engine running. We receive no government funding. Our team works hard to ensure even the smallest contributions go a long way. No amount is too small and all donations will help build a better, fairer New Zealand. Donate via internet banking through our BNZ account: 02-0560-0155430-01 or our Kiwibank account: 38-9012-0571645-00. 2) Drop us a quick email at [email protected] so we can be on the look out for your kind donation. Thank you! Need to know more before you donate? Check out our Annual Report to see how ActionStation members' donations were spent in 2016, head on over to our FAQ page, or drop us a line. Donations to ActionStation are not tax deductible. You can find our donation policy here.